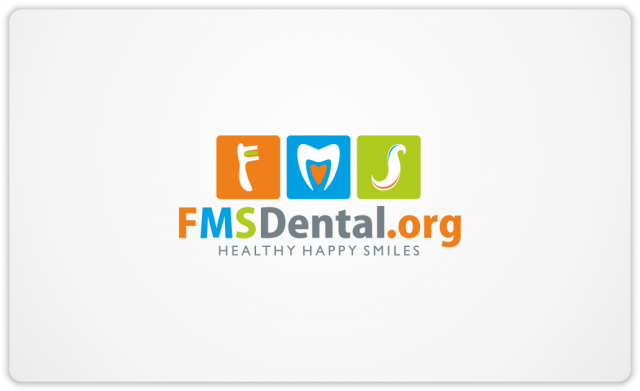 Healthy happy smiles – logo for FMS Dental | Natalia Sutkiewicz - Graphic Designer Portfolio. Logo, Business Cards, Stationery. Finally I had a chance to create a more fun looking logo for a project started up by FMS Dental, which is a general dentistry from Houston in Texas, USA. They are going to launch their new website soon. This assignment went really quick, as client had a clear vision of what she was looking for, so my task was mainly to translate that vision into a graphical design. Request was to make a logo build from 3 blocks, in which letters FMS were supposed to look like a toothbrush, a tooth and a swirl of toothpaste. I used a lot of colours, to give it a fun and cheerful look, attractive especially for kids.